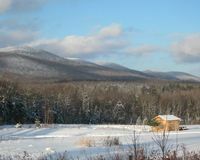 The Lowell Mountains in Vermont are currently targeted by a foreign owned power company to be developed into a industrial scale wind project. Building the proposed twenty one 460ft tall turbines will require the construction of massive roads, the clear cutting of turbine bases and transmission lines and intense blasting of rock formations. The construction and operation of the project will impact wildlife habitats and crucial headwater streams permanently. Vermont's scenic beauty, vast wildlife, and prominent green mountains are legendary throughout the world. Poets, writers, artists, photographers have lauded this magical landscape. Industrial scale wind turbines inside this ecologically sensitive and impressively beautiful area is simply inappropriate. Please help us let elected officials in Vermont know that this type of development should not be tolerated. Vermont's natural wonders should belong to the wildlife, its people, and the world, not to corporations looking to profit.